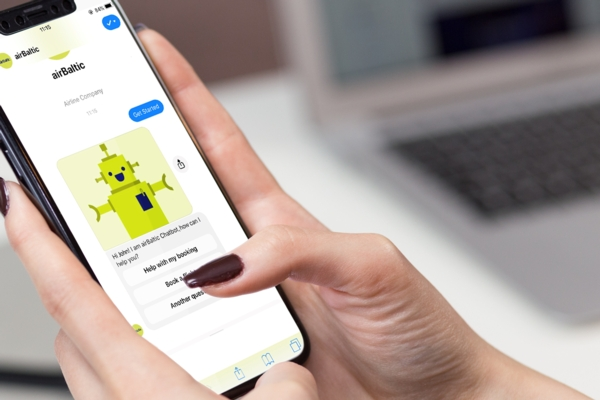 Latvian airline airBaltic has become the first airline in the Baltic states to launch a chatbot for the company’s Facebook Messenger account, thus further improving the customer service. Chatbot is a program designed to simulate a conversation with real users. Martin Gauss, CEO of airBaltic: "airBaltic is known globally for its innovative services and is excited to be among the pioneers who introduce chatbot for its Facebook Messenger account that will make the customer service faster and more efficient. With the chatbot, we can reduce the response time from an average of 15 minutes to just a few seconds." The airBaltic chatbot provides such services as answers to the most frequently asked questions about baggage and booking management, as well as introducing users to airBaltic destinations. According to the current plan, in the future passengers will be able to check in with a chatbot, as well as receive their boarding passes via Facebook Messenger. As with any new technology, airBaltic is constantly analysing the performance of the chatbot in order to make the necessary improvements. At the moment, work is under way to make correspondence available in several languages. The customer will be able to contact a human customer service specialist at any time. airBaltic serves over 70 destinations from Riga, Tallinn and Vilnius, offering the largest variety of destinations and convenient connections via Riga to its network spanning Europe, Scandinavia, the CIS and the Middle East. In summer 2019, airBaltic will launch new destinations from Riga to Dublin, Stuttgart and Lviv, as well as Kos and Menorca. airBaltic (AIR BALTIC CORPORATION) is the most punctual airline in Europe connecting the Baltic region with over 70 destinations in Europe, the Middle East, and the CIS. airBaltic is a joint stock company that was established in 1995. Its primary shareholder is the Latvian state, which holds 80.05% of the stock, while Lars Thuesen holds around 20% through his fully-owned Aircraft Leasing 1 SIA. The airBaltic fleet consists of 35 aircraft – 15 Airbus A220-300s, 8 Boeing 737s and 12 Bombardier Q400Next Gen aircraft. airBaltic has received numerous international awards for excellence and innovative services. In 2017, the airline received the CAPA Regional Airline of the Year award, while in 2018 and 2019 airBaltic received the ATW Airline Industry Achievement Award as the Market Leader of the Year. airBaltic achieved the best on-time performance globally in 2014, 2015, 2016, 2017.